Christmas bulletin board ideas and related themes. You will not need much guidance when it comes to Christmas bulletin board ideas. 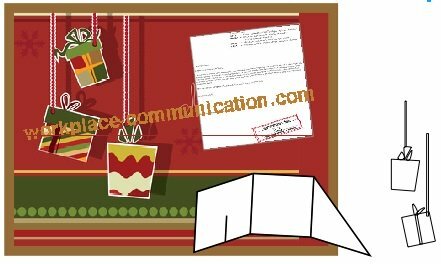 The exchange of Christmas gifts and Yuletide greetings will make the December bulletin board ideas come alive when ushering the past year out to invite the New Year in. As part of the Christmas holiday bulletin board ideas you could opt for the idea of a Christmas tree with real tree cutouts and sprigs or the snowflake theme. Workplace communication tools, methods and techniques could involve getting all the office team putting their heads together and thinking of some December bulletin board decorating ideas for this special time of year. The board ought to be inviting, fun and unique. The board could also be decorated with candy canes and tinsel. Let people bring their favorite photos of their loved ones that have passed on, pets they had cherished, etc. It would be nice to decorate with yellow ribbons, flowers, angels, and the American flag (in case they passed in the line of duty). Call this one "In Remembrance". The main board could be light blue with white clouds to represent the sky. Decorate the board with red, white and blue (save decorations for Fourth of July). Have people put up their family members in military uniform, both living and deceased, as well as pictures of their selves in military uniform. Decorate with red, white and blue and add exploding firecrackers. Have a picnic sign up list for bringing food, see if company will sponsor some game prizes, get a small committee to do face paint, give out prizes and run games, set a date (it can be before or after the fourth; if it is before it would make a great board for June) and have fun! Start with a black background or color of your choice. Find out what local non-profit organizations need volunteer help in your area. Put up information from different chapters and a sign up board for volunteers from your office to all work on the same off day. Food banks usually let groups work on Saturdays. Show pictures of senior citizens and kids smiling. These are the groups that usually need the most help. This may make a good food can collection time for a local pantry as well. The title of this board can be "Give a Little, Get a Lot." Decorate the border in black and white twisted crepe paper. On a red board, put up information from the local blood bank. They will book a date (in advance) to come by for free and will usually give you flyers of what the freebies are for participants, like free t-shirts or zoo passes, etc. that can be added to the board as cut-outs. Circulate a list around the office for the day scheduled. "Give Life" could be the title for this one. Of course with America growing and adding more types of worship than traditional Christmas, this can get tricky, but with Christmas, Hanukkah/Chanukah and Kwanzaa, the board will be more than busy with images of traditional Christmas, Jewish Festival of Lights and African Heritage and culture celebration. You could title this board "Christmas Holidays" or "Traditional Holidays." Decorate the border with red and green crepe paper and divide the main board in thirds to divide into three decorated sections mentioned above. In most parts of the USA by February, everyone has either seen snow or has it on the ground. It would be cute to put up a board with winter sports, cups of hot cocoa, snowflakes and either cutout snowmen/snow people or pictures that people have of the snow people or snow sculptures they have made. The title for this board could be "Snow Day."